In fact it is a good tyres, but with a short lifetime. Driving experience with Yamaha X-Max 400 ABS. Front 120 / 70-15, Rear 150 / 70-13. City Grip Winter - Expensive, Dangerous and Lethal. ABS cuts in on a warm dry road on Moderate Breaking. Cornering is poor with a drop in sensation while going straight on. There is no cornering stability, even gentle corners you fight the steering which will go light and the tyre slips. On a Cold Wet road, ABS cuts in all the time, steering is non existent, and slips even at walking speed. Don't even consider relying on them in an emergency. They will let you down. The tyres at 600km have badly worn with feathering on the tread. After a 30mile/ 50 km Motorway speed journey on a dry road the tyres are cold. Sold as a winter tyre they may meet mud and snow regulations. 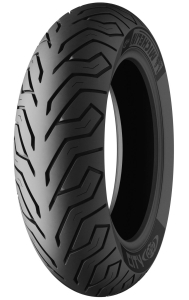 With improved grip in winter conditions and improvement on previous tyres. In my experience (20 years riding and 8000km a year they are the most dangerous and lethal tyres I have had this misfortune of using . DO NOT PURCHASE - they should be banned from sale before they kill. Great tyre. Just slippery in damp conditions, on a scooter anyway.